Plot Summary: Joel receives a disturbing letter from Elaine, while Holling’s gift to Shelly backfires. 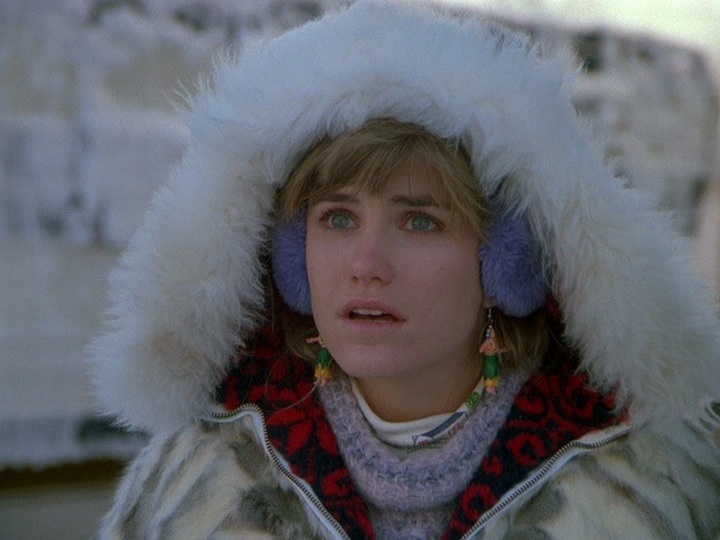 In the opening episode of the second season of Northern Exposure, we discover that the residents are in the middle of an Alaskan winter. For the thin-blooded New Yorker Joel, this is a big adjustment. His office has holes in the walls, and he wears his parka indoors. His only bright point at the end of the tunnel is his upcoming trip to New York to visit Elaine. However, everything comes crashing down when Joel receives a letter from Elaine, who informs him that she has fallen in love with a retired judge, and is living in Kentucky with him. A relationship has ended. When Holling buys Shelly a satellite dish it is with the rationale that she could “see the whole wide world” with him by her side. As soon as the television is turned on, it becomes the centre of attention; instead of people sitting in booths at the Brick and talking, the residents instead train their eyes on the tube. Throughout the program we indeed see glimpses of other parts of the world, including an Italian documentary about a Chinese food market, the hottest soap opera in Puerto Rico, and Magnum P.I. in Japanese. (It’s worth mentioning that Shelly is wearing earrings featuring Hawaiian figures when the satellite dish arrives, and she is watching Magnum P.I., a show set and filmed in Hawaii, when she has her breakdown.) For Shelly, it is love at first sight, and she can’t stop watching. A relationship has begun. The arrival of the satellite dish has the opposite of its intended consequence. Instead of bringing Holling and Shelly together, it separates them. Shelly develops a home shopping network addiction and spends their honeymoon money. Shelly believes that TV is bringing her the world, but she doesn’t realize that it is drawing her away from it. She doesn’t sleep or eat, she stops working, and she lashes out at people when they try to talk to her during her endless series of must-see programs. For Joel, it is life that is crushing him. He describes getting the letter from Elaine as being “punched in the gut.” He tries to dive back into the dating pool but finds the water has drained before he’s even found his swim trunks. Ed eventually finds him lying in bed, deflated and heartbroken. Even Maggie is perturbed to find him lying down in his examination table in the dark, defeated. But let’s examine the role of television/film in this episode. The medium takes Shelly away from the world, and makes her ignore her real life. However, Joel’s film fantasies may provide him a way of framing or understanding the disintegration of his relationship with Elaine. The WWI trench scene provides him with a way to cope with receiving the “Dear John” letter, while the scenes with his old girlfriend Tori and the younger Joel gives him a much-needed wake-up call. 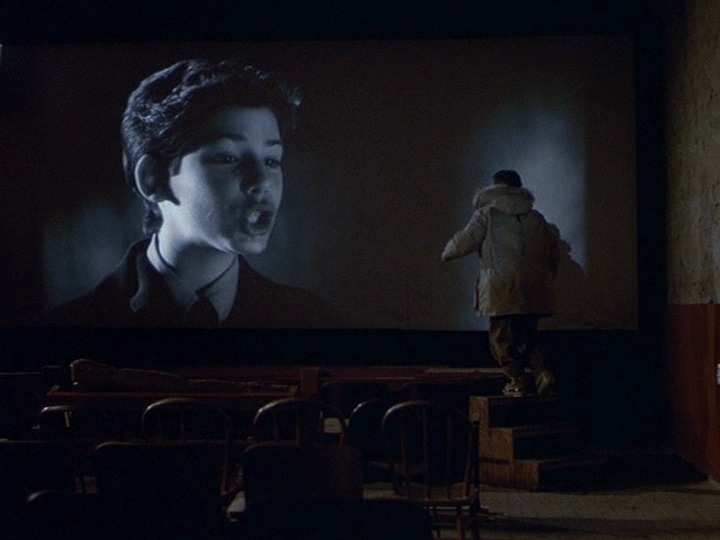 The Graduate-inspired silent film sequence may help him bid a final goodbye to Elaine. However, it is the re-enactment of his perfect day with Elaine, which provides Joel with a path towards healing. Concerned that Joel doesn’t have closure, Ed “directs” Joel’s “last 15 minutes of his and Elaine’s movie,” with Holling delivering iced coffees to an outdoor table, and Maggie in a black dress with spaghetti straps and pearls playing Elaine. By staging this event like a sequence from an unfinished film, Ed manages to bring Joel back from depression. 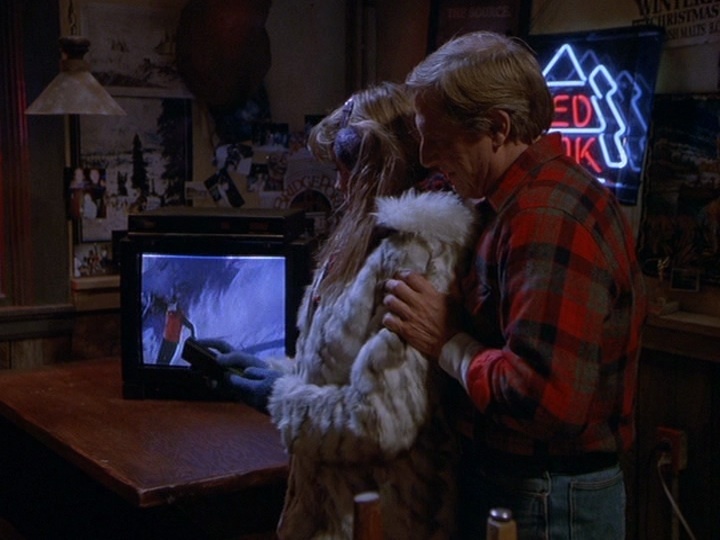 Though the final scene of this episode has Shelly turning off the TV (for herself and the viewers) and is seemingly critical of television, we also get a sense of how television and film can bring people together and help them understand the world around them, which is certainly true of the best episodes of Northern Exposure. Themes/Recurrences: Relationships, men/women struggle, television/reality. 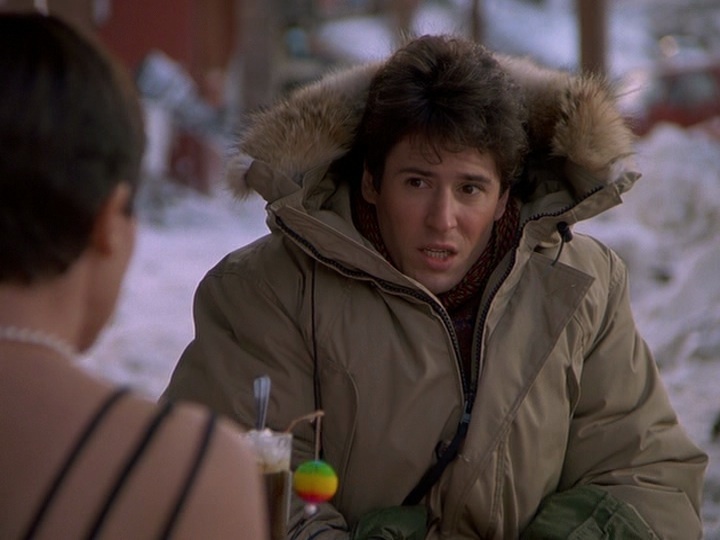 The Good: Joel (Rob Morrow) is wonderful in this episode. We can feel his anguish, but it isn’t at all overdone. The Bad: It’s too bad that they couldn’t get Jessica Lundy to reprise the role of Elaine. She would have been a great addition because she was so warm and likeable. With her absence, the episode is lacking in dimensionality. The Notable: There are many echoes of Season One, particularly the allusions to The Graduate, Ed appearing in Joel’s bedroom, and the music (“Blue Moon,” “Let’s Dance” – however, these are sadly replaced in the DVD version).